The U.S. Bishops have zeroed in on the main evil of our society for a two-week highlight: our religious liberty is under attack. The evils Pope Francis points to in his recent encyclical Laudato si’ – poverty, racism, environmental degradation, the commodification of women – are not the main problems we face as citizens of this nation. 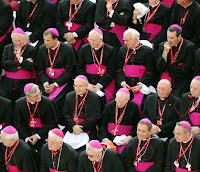 No, for the U.S. bishops the main problem for us is that Catholics are being denied religious liberty in the U.S. The hypocritical self-reference is embarrassing. Since when have Roman Catholic bishops cared about religious liberty for Catholics within their own institutions? Employees have to sign an oath of orthodoxy to teach in schools or work in parishes. Pastors have to seek approval for speakers in their parishes. Questioning Catholics may not assemble on parish property and are condemned as “dissenters.” Whole communities of Catholics are banished from communion because their liturgical practice is not uniform. How “free” is religion and religious practice in the Roman Catholic Church? Since when have Roman Catholic bishops valued individual liberty as a factor of human dignity? The Roman Catholic bishops of the U.S. have been determined to deny gay and lesbian citizens the freedom to marry under civil law. They have fought the individual liberty of women in choosing to reproduce. They have fought to separate Catholics from the “world” in a superior and isolated “Catholic identity” by constant preaching about the evils of individual liberty in the larger society. American Catholics have been formed in the values of two traditions – the value of community in the Roman Catholic tradition and the value of individual liberty in the U.S. democratic tradition. Most of us have learned to value both, to integrate the two more or less successfully. We try to avoid both the excesses of “group think” and the excesses of “go-it-alone” individualism. We have to do this without the support of our institutional church. The U.S. bishops who focus on the Roman Catholic traditional values exclusively are increasingly irrelevant to Catholics who have integrated the values of individual liberty and equality from the U.S. democratic tradition. They are entirely irrelevant and antagonizing to citizens of other religions and no religion. The tragedy of this situation is that Roman Catholic community values have a great contribution to make to a society that can tend too easily to the excesses of individual liberty. To contribute the vision of human community Pope Francis provides in Laudato si’ to the U.S., the U.S. bishops will also have to affirm and demonstrate value for individual liberty. As things stand, their “Fortnight of Freedom” has the sound of a tinkling cymbal. This is a very timely article. The US bishops have inadvertently created a catch 22 for themselves by attempting to be simultaneously for and against individual liberty. But they cannot have it both ways, especially when individual liberty is universally regarded as the bedrock of American democratic tradition. In attempting to have it both ways to suit their convenience, the bishops render themselves not only irrelevant and out of touch as Paula suggests, but blatantly political as well. That destroys their credibility both within and outside of the church, and squanders their built in opportunity to do good in church and society. They have shot themselves in the foot. Thanks Paula especially for your point on "self referencing." Is there not a single bishop who disagrees? Are we confronted with "Omertà," sworn silence, no dissent allowed?